Background and objectives Circulating monocytes can be divided into functionally distinct subpopulations according to their surface expression of CD14 and CD16. Monocytes with high-level expression of both antigens (CD14++CD16+, Mo2 cells) are associated with cardiovascular morbidity and mortality in hemodialysis patients. These cells express angiotensin converting enzyme (ACE) on their surface. They are involved in the association of chronic inflammation and cardiovascular disease in kidney patients. Cardiovascular morbidity results from atherosclerosis (plaque-forming, vessel occluding disease) and arteriosclerosis (loss of arterial dampening function). It is unknown whether ACE-expressing proinflammatory monocytes are related to atherosclerosis, arteriosclerosis, or both. Design, setting, participants, & measurements During baseline examination for a prospective study on monocyte ACE expression and mortality, 60 chronic hemodialysis patients of an academic outpatient center were screened for atherosclerosis by carotid artery ultrasound, for arteriosclerosis by pulse pressure measurement, and for ACE expression on Mo2 cells by flow cytometry. Results ACE expression on Mo2 monocytes was significantly higher in patients with severe compared with those with little or no carotid atherosclerosis. Mo2 ACE correlated with a score to semiquantify atherosclerosis and remained a significant predictor of carotid plaques in multivariate analysis including the other univariately associated variables of age, hemoglobin A1c, and albumin. Mo2 ACE was not related to pulse pressure. Conclusions ACE expression on Mo2, although being a known predictor of mortality and cardiovascular disease in end-stage renal disease patients, may act via enhancement of atherosclerosis rather than arteriosclerosis. The life span of patients with dialysis-dependent chronic kidney disease (CKD) is limited by the high prevalence and progression of cardiovascular disease (CVD). There is abundant evidence for a several hundred times increased risk compared with individuals with normal renal function (1). The so-called classical cardiovascular risk factors such as arterial hypertension, hypercholesterolemia, or smoking contribute to this risk; however, they cannot explain its whole extent (2). More than a decade ago, the important role of systemic inflammation for CVD was described (3), which led to a new perception of atherosclerosis as an—at least in part—inflammatory disease (4). Inflammation was found to contribute significantly to the cardiovascular risk in chronic renal failure. Elevated levels of C-reactive protein (CRP) are common in dialysis patients and they enhance the risk of death from CVD (5). Inflammation in chronic renal disease is caused by the interaction of decreased renal clearance of cytokines and immunoactive proteins with enhanced metabolic and oxidative stimuli due to uremia (6). In 1902, Mönckeberg (7) separated atherosclerosis as the plaque-forming vascular disease leading to vessel occlusion from arteriosclerosis as the arterial stiffening leading to loss of dampening function, high pulse pressure, and left ventricular pressure load. This pathophysiological distinction is still valid today. Patients with chronic renal failure obviously suffer from atherosclerosis (8) and arteriosclerosis (9). Although the relation between inflammation and cardiovascular mortality in CKD is common knowledge, it remains unclear whether inflammation actually contributes to atherosclerosis, arteriosclerosis, or both. In fact, the pathogenesis of inflammation-induced progressive vascular disease in CKD is still not precisely known. It seems rather unlikely that circulating proteins such as CRP directly influence the growth of vascular atherosclerotic plaques. However, inflammation is also characterized by activation of immune competent cells such as monocytes in the peripheral blood. Monocytes are major sources of proinflammatory cytokines and they are found within atherosclerotic plaques. In patients with chronic renal failure, high numbers of proinflammatory monocytes are a hallmark of systemic inflammation. Circulating monocytes are composed of several functionally distinct subpopulations that can be characterized by flow cytometry by their expression of the LPS receptor CD14 and the Ig Fc segment receptor CD16 (10). For the ease of communication, we termed the typical populations Mo1 (CD14+CD16−), Mo2 (CD14++CD16+), and Mo3 (CD14+CD16+), with Mo2 probably being the most relevant population for vascular disease (details and graphical presentation in 11). These cells express the angiotensin converting enzyme (ACE) on their surface (12). By infiltrating the vessel wall, Mo2 cells carry ACE into the plaque (13), making the enzyme that produces the highly proinflammatory and pro-oxidative angiotensin II (14) available within the vessel wall lesion. In several independent cohorts, we recently reported an association between elevated counts of Mo2 monocytes and subclinical (15) or manifest atherosclerosis (16,17) as well as cardiovascular outcome (11,16–19). Furthermore, the level of ACE expression in the Mo2 monocyte population proved to be highly predictive of mortality in dialysis patients (19). It is likely that monocytes promote mortality via atherosclerotic rather than arteriosclerotic alterations. To support this hypothesis, we used clinical methods to assess the presence of atherosclerosis (ultrasonography of the carotid arteries) and arteriosclerosis (predialysis pulse pressure) during recruitment for our prospective study on monocyte subpopulations, ACE expression, and mortality in chronic hemodialysis patients (19). In a recent clinical trial on 74 ESRD patients (64 on hemodialysis, 10 on peritoneal dialysis), monocyte subpopulation numbers and ACE surface expression were determined at baseline and mortality was recorded prospectively (19). In 60 of the 64 patients on hemodialysis from the outpatient dialysis facility of the University Hospital at Homburg/Saar, Germany, carotid ultrasound could be performed at baseline. The remaining four patients chose not to participate. Patients on peritoneal dialysis were not included in the ultrasound study. Patients could be included if they had CKD and were on dialysis treatment for at least 2 months. They could not participate if they had ongoing immunosuppressive medication, acute illnesses requiring hospitalization, a history of carotid artery surgery, or a central venous catheter for dialysis that hampered carotid ultrasound studies. All patients had blood samples drawn before the mid-week dialysis session from the dialysis access. The causes of renal disease were diabetic nephropathy (n = 21), glomerulonephritis (n = 12), polycystic kidney disease (n = 5), interstitial disease (n = 6), nephrosclerosis (n = 5), and other/unknown (n = 11). The study was conducted according to the Declaration of Helsinki and approved by the local ethics committee. All patients gave informed consent. The patients were treated thrice weekly for an average of 12.1 ± 1.5 hours with bicarbonate dialysate and polyamide (n = 18; Gambro, Gröbenzell, Germany) or polysulfone (n = 15; Fresenius, Bad Homburg, Germany) high-flux or hemophane (n = 27; Gambro) low-flux dialyzers. Patients with self-reported diabetes mellitus with a spontaneous plasma glucose level of >200 mg/dl and/or with hypoglycemic treatment were categorized as diabetic (n = 33). Body mass index was calculated as weight (kg)/height (m)2. The vessel wall alterations of the carotid arteries were detected by B-mode ultrasound using a Siemens Sienna device with a 7-MHz linear probe (Siemens, Erlangen, Germany). All measurements were done on both sides. The common carotid artery (CCA) was visualized longitudinally for at least 3.0 cm from the bifurcation. The probe was adjusted until the distal wall of the artery clearly showed three layers over the entire length of the sample area. Then the probe was turned by 90° and a transversal view of the CCA was taken again, ensuring that the triple-layer structure of the distal wall could be seen. The probe was moved cranially to visualize the carotid bifurcation and again turned by 90° to see two planes. All views were photo documented and stored for later analysis. The atherosclerosis score (“atheroscore”) was calculated as follows: The CCA and the carotid bifurcation were assigned 0 to 2 points on each side, which were added. The score thus reached 0 to 8 points in each individual patient. The CCA was coded as 0 if no plaques or wall irregularities were seen within the 3.0 cm caudal to the bifurcation. It was coded 1 if few plaques could be seen that spanned <25% of the visualized artery surface, 2 points were assigned for many or large plaques spanning >25% of the surface. The bifurcation in a transversal view very often shows (semi) circular plaques that span a part or the entire circumference. The bifurcation was coded 0 if there was no plaque or the plaque spanned <25% of the circumference. It was coded 1 with the plaque spanning 25% to 50% of the circumference and 2 with a plaque that embraced the artery >50%. Calcified or soft plaques were not distinguished. All ultrasound studies were done by one experienced sonographer and evaluated offline on the basis of the stored photographs while the examiner was unaware of the clinical and laboratory features of the patient. 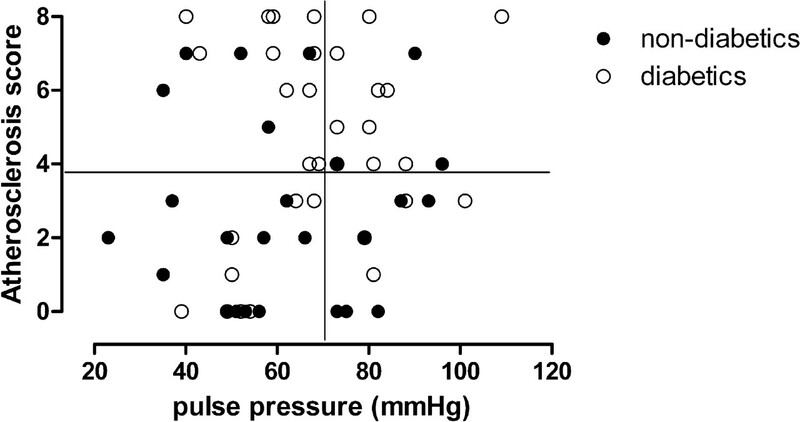 As a surrogate for vascular stiffness (arteriosclerosis), the pulse pressure was calculated from predialysis BP readings as pulse pressure = systolic BP − diastolic BP (mmHg). The BP reading was obtained after the patient had made himself/herself comfortable on the treatment bed in a supine position with the upper part of the body reclined at an angle of 45°. The readings were taken with an automated device (Critikon Dinamap 8102, GE Medical Systems, München, Germany) after a resting period of 5 minutes with an arm-size adapted cuff at the upper arm. Blood was drawn before the start of the mid-week hemodialysis session. All samples were analyzed immediately within 4 hours. Plasma glucose, total and LDL cholesterol, calcium, phosphorus, albumin, hemoglobin, hemoglobin A1c (HbA1c), serum ACE, and CRP were obtained using standard clinical chemistry techniques. Leukocyte and monocyte counts were measured with automated cell counters by standard techniques. Monocyte subpopulations were flow-cytometrically analyzed in a whole blood assay using 100 μl of heparin-anticoagulated blood. The cells were stained in whole blood after washing out plasma ACE by extensive washing with phosphate-buffered saline containing 5% fetal calf serum (Seromed, Berlin, Germany). The following monoclonal antibodies were used for staining: CD86 (HA5.2B7, Beckman-Coulter, Krefeld, Germany), CD16 (3G8, Invitrogen, Karlsruhe, Germany), CD14 (Mφ9, BD Biosciences), and CD143 (9B9, Serotec, Düsseldorf, Germany). After erythrocyte lysis, cells were analyzed by flow cytometry (FACSCalibur, BD Biosciences, Heidelberg, Germany) using the Cell Quest software. Monocytes were gated in a SSC/CD86+ dotplot identifying monocytes as CD86+ cells with monocyte scatter properties. Subsets of Mo1, Mo2, and Mo3 monocytes were defined as reported earlier (11). Absolute numbers of monocyte subpopulations were calculated from the relative frequency among the monocytes as measured into the SSC/CD86 gate multiplied by the monocyte number determined by a differential cell count. Categorical variables are presented as percentage of patients. Continuous data are expressed as mean ± SD and compared by Mann–Whitney test. Univariate correlations are calculated by linear regression analysis and reported as Spearman correlation coefficients. A multiple linear regression analysis was performed using the atheroscore as the dependent variable. Further variables that correlated with the atheroscore in the univariate analysis were introduced as covariates. Data management and statistical analyses were performed with the SPSS 17.0 statistical software (SPSS, München, Germany) and the Prism 5.02 software (GraphPad, San Diego, CA). The level of significance was predefined at P < 0.05. The patients included in this analysis are characterized in Table 1. Pulse pressure was used as a surrogate for vascular stiffness and atherosclerotic plaques were visualized by B-mode ultrasound in the CCAs and the carotid bifurcation. The pulse pressure and intensity of atherosclerotic plaques in the individual patients are related in Figure 1. A pulse pressure of ≥70 mmHg was associated with enhanced mortality in a large cohort analysis of hemodialysis patients (20). Patients with a predialysis pulse pressure ≥70 mmHg were classified as having arteriosclerotic disease whereas the diagnosis of severe atherosclerosis was arbitrarily based on an atheroscore of ≥4. With these definitions, 26% of the patients had predominant atherosclerosis, 18% had predominant arteriosclerosis, and 21% had both alterations. One third of the patient population had neither vascular alteration in this screening. The prevalence of the plaque-forming disease was slightly higher in diabetic patients (atherosclerosis only, 33%, combined with arteriosclerosis, 30%) than nondiabetics (Figure 1). Individual relation between atheroscore and pulse pressure in 60 chronic hemodialysis patients. Patients with diabetes mellitus are marked with open circles, and patients without diabetes are shown in black circles. Monocyte subpopulations were divided according to the cellular surface expression of CD14 and CD16. Three different subpopulations were termed Mo1, Mo2, and Mo3 as recently described (11,19). The number of subtype-specific circulating monocytes were not significantly different in patients with or without atherosclerosis and/or arteriosclerosis (Table 2). Monocytes express ACE on their cell surface to different extents. Compared with Mo1 and Mo3, ACE expression is strongest in the Mo2 subset. The expression density of ACE in the Mo2 population was significantly higher in patients with an atheroscore ≥4 than those with a low atheroscore, whereas ACE expression between patients with high pulse pressure did not differ from those with lower pulse pressure (Figure 2). Expression of ACE on the surface of Mo2 monocytes in relation to the atheroscore and the pulse pressure. ACE expression is given as mean fluorescence intensity (MFI). The box plots show the median (center line), the 25th and 75th percentile, and the range (whiskers). For atheroscore, mean ACE expression levels were significantly different by Mann–Whitney test. The atheroscore was significantly correlated with age, serum albumin, and HbA1c, whereas pulse pressure only showed a correlation with age (Table 3). Several other parameters that might be associated with vascular disease in dialysis patients were not predictive in univariate analysis (body mass index, CRP, total cholesterol, LDL, HDL, calcium, phosphorus, parathyroid hormone, and dialysis vintage). Interestingly, CRP was not related to the atheroscore; however, there was a tendency pointing toward an association with pulse pressure. The parameters that showed univariate correlation were introduced in a multivariate linear analysis together with the expression of ACE on Mo2 monocytes (Table 4). In this analysis, only age, HbA1c, and monocyte ACE expression remained significantly and independently associated with the atheroscore. More than half of the patients in this series had diabetes mellitus as the cause of renal dysfunction (21 patients) or as concomitant disease (12 patients). The HbA1c level correlated with the atheroscore, indicating a strong role of diabetes for the presence and extent of atherosclerosis. 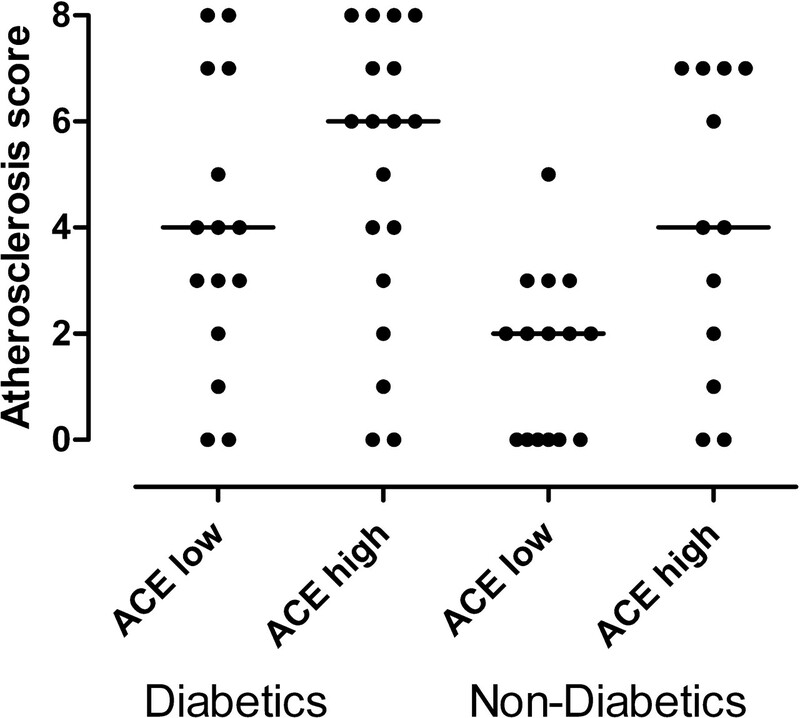 The expression of ACE on Mo2 monocytes did not differ between patients with or without diabetes (with diabetes, 72.8 ± 38.4; without diabetes, 58.3 ± 38.8, P = 0.15). Figure 3 illustrates that ACE expression in the Mo2 monocyte population is an independent factor for the severity of atherosclerosis that interacts with vascular risks due to diabetes. Atheroscore in patients grouped according to diabetes state (yes/no) and expression level of ACE on Mo2 monocytes (below/above median). The expression of ACE on monocytes is also independent from age in its prediction of atherosclerosis. 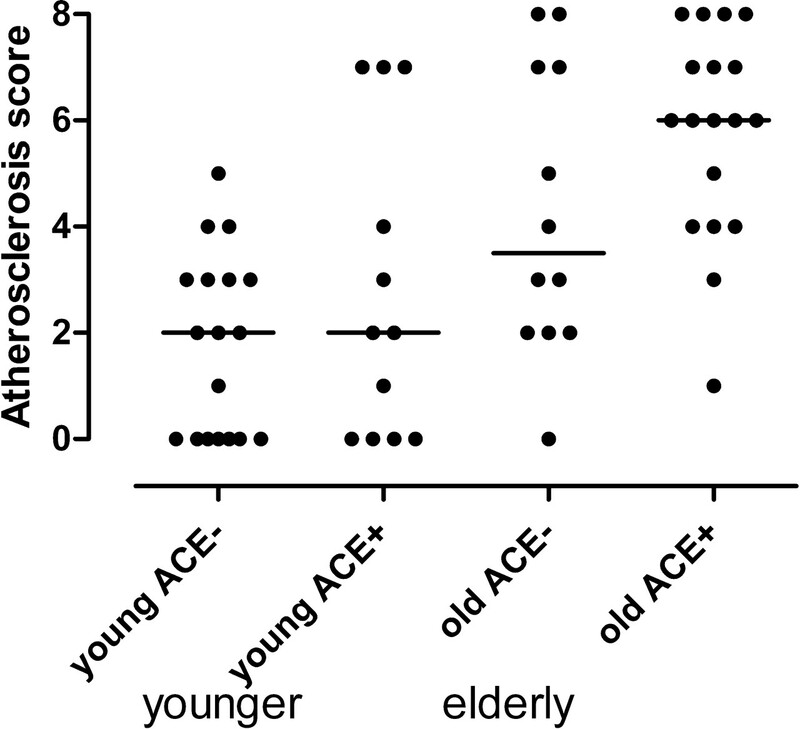 However, in the younger (≤68 years, mean 53.6) individuals of this series, ACE expression had little effect on atherosclerosis (Figure 4), whereas this effect was very pronounced in the elderly (mean age 77.8 years). Atheroscore in the younger and older half of the patients with regard to the ACE expression level (below/above median). Patients with end-stage renal disease have different types of vascular disease. In this study, vascular stiffening and plaque-forming disease of the media occurred alone or in combination in roughly equal parts of the population. It is likely that the pathogenesis of atherosclerosis and arteriosclerosis is different. The main question of this study was whether inflammation, in particular activation of circulating monocytes, a well known predictor of cardiovascular mortality in dialysis patients, relates to one or both of the vascular diseases. The main predictor of atherosclerosis and arteriosclerosis was age. This does not come as a surprise because age is related to any kind of CVD also in patients with normal renal function (21). Several other classical cardiovascular risk factors such as cholesterol or BP were unrelated to the markers of arterial disease in this series. This is consistent with the finding from large clinical trials that lowering lipid levels in dialysis patients does not necessarily lead to improvement in cardiovascular prognosis (22,23). In addition, there is an ongoing controversy regarding which BP level should be achieved in these patients because their benefit from low predialysis pressures is not clear (24). Mortality and cardiovascular event rates are clearly associated with inflammation. Several studies linked markers such as CRP (5,25), IL-6 (26), or monocyte subpopulation shifts (11) to mortality. However, the causes of death are mostly ill-defined in these studies because many dialysis patients die outside of the medical centers and the exact cause of death cannot be confirmed. Cardiac failure of the hypertrophic heart, malignant arrhythmia, and myocardial infarction often cannot be distinguished in this polymorbid patient group. Earlier studies from our group showed that a subpopulation of monocytes with proinflammatory properties is expanded in dialysis patients (11). These cells may express high levels of ACE on their surface, making them a particularly strong omen of adverse outcome (19). We thus intended to detect surrogates of atherosclerosis and arteriosclerosis to find out which of these diseases is actually influenced by inflammation, by high proinflammatory monocyte numbers, and by monocyte ACE expression. In our small study, CRP did not significantly correlate with vascular alterations. The study was underpowered to prove such a relation that has been found by other investigators with other experimental settings (27–29). However, it seems safe to conclude that the effects of ACE-expressing monocytes described in this study are not weaker than a putative effect of CRP. Although in our prospective study in the same patients the presence of the highly ACE-expressing monocytes of the Mo2 type was predictive of an alarming mortality (19), we now suggest that this cellular marker relates to atherosclerosis but not arteriosclerosis. This enhances our understanding of how ACE-expressing monocytes might interfere with cardiovascular mortality. Most likely, proinflammatory monocytes are directly involved in the subendothelial processes leading to atherosclerotic plaques. Their physiologic role is to patrol the vascular endothelium in search for endothelial defects (30). At such lesions, they infiltrate the subendothelial space (4). This mechanism intends to access and destroy infectious foci; however, when endothelial damage arises from chronic vascular disease, this subendothelial access may lead to atherosclerotic plaque formation. Monocytes and monocyte-derived macrophages can be detected in the plaques of human coronary arteries (31), where they express proinflammatory cytokines (31,32) and ACE (13) and collocate with angiotensin II activity within the plaque (32). Highly activated proinflammatory monocytes in the circulation may enhance plaque growth and progression of vascular disease. Our study cannot prove such a model; however, it provides hints that justify further experimental research on this topic. This study has several limitations, the most important is the small sample size. Because monocyte subpopulations can only be measured in fresh blood samples that need to be processed for immunostaining and flow cytometry within a few hours, it is difficult to perform multicentric studies to include large patient numbers and to avoid mixed morbidities as in this series. Consequently, all previous studies on monocyte markers in CKD are of limited sample size. Nevertheless, this study at least supports the interesting new hypothesis that ACE-expressing Mo2 cells are related to atherosclerosis rather than arteriosclerosis. Another limitation is the rather crude method to detect vascular alterations. We are aware that much more sophisticated technology is available for the quantification of vessel wall plaques and for vascular stiffness. However, we used a very conservative approach to classify patients as having severe versus hardly any atherosclerosis, which can easily be done by carotid ultrasound. As a consequence, we cannot yet definitely rule out that monocyte ACE expression might also relate to arteriosclerosis when using techniques such as pulse wave velocity measurement. An interesting question arises whether the detection of atherosclerosis at one vascular region (i.e., the carotid arteries) can be generalized to atherosclerosis in other vessel domains. There can be no doubt that a close relation among carotid, coronary, and peripheral atherosclerotic disease exists in patients with chronic renal failure (33). Some 70% of the individuals with peripheral disease also had coronary disease and 42% had cerebrovascular disease. It is justified to assume that CKD patients mostly suffer from systemic atherosclerotic disease. In conclusion, this study suggests that highly ACE-expressing monocytes of the Mo2 subpopulation are directly involved in the pathogenesis of atherosclerosis but not arteriosclerosis in chronic renal failure patients on hemodialysis treatment. This might explain the previous finding of the high predictive value of detecting these cells for mortality of the patients. Further research should address the conditions leading to high circulating numbers of this cell population with high surface ACE expression.